Radagast announced Thursday that it would recall certain lots of beef, chicken, and turkey Rad Cat Raw Diet pet food because they may be contaminated with Salmonella and/or Listeria monocytogenes. According to a notice posted with the Food & Drug Administration, the recall was initiated after lab tests confirmed salmonella and/or listeria in samples of the cat food. An FDA-contracted third-party lab found two lots of Grass-Fed Beef tested positive for listeria, one lot of Free-range Chicken tested positive for listeria, and one lot of Free-range Turkey tested positive for salmonella and listeria. 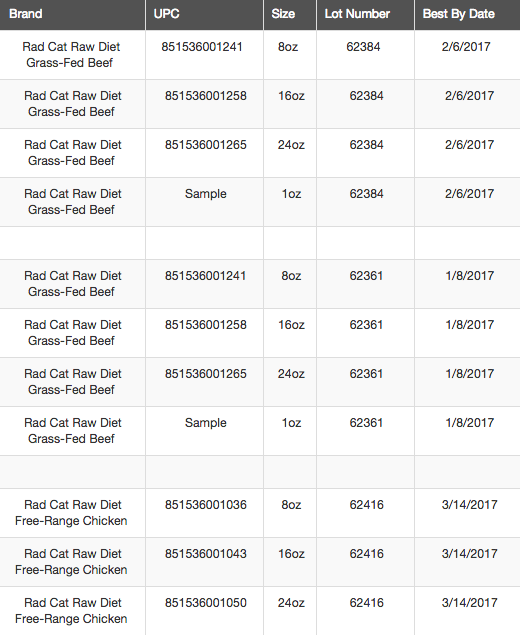 The recall covers products, which were sold at retailer in 48 states except for Hawaii and Mississippi, in a variety of sizes and package styles of the Rad Cat Raw Diet pet foods, including free 1-ounce sample cups as well as 8-, 16- and 24-ounce tubs. Affected products can be identified by the lot codes 62384, 62361, 62416, and 62372 and Best By dates are located on the lid of all products packaged in tubs and on the bottom of the sample cups. Radagast Pet Food warns that the bacteria found in the food can pose a risk to both pets and humans, especially if they have not thoroughly washed their hands after having contact with the products or any surfaces exposed to these products. Pets with salmonella or listeria infections may be lethargic and have diarrhea or bloody diarrhea, fever and vomiting. Some pets may have only decreased appetite, fever and abdominal pain, according to the recall notice. Infected but otherwise healthy pets can be carriers and infect other animals or humans. If your pet has consumed the recalled product and has these symptoms, contact your veterinarian. Consumers who purchased recalled products should not return them to a retailer but dispose of them securely. However, Radagast will provide customers with refunds. This can be done by filling out all sections of the company’s Consumer Claims Form which can be found on their website www.RadFood.com and returned to the retailer where they purchased the product for a refund.